I and my wife applied for UK Visa on July 18th from The Netherlands through an agency called TLSContact. On 4th of August, we got an email saying that the decision has been made. On 7th of August I received one of the Passports but for the other one, the tracking shows as Shipment information received. 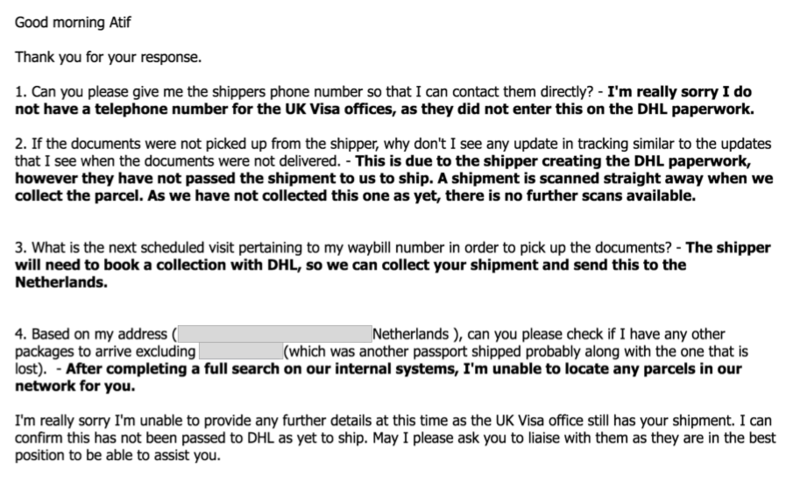 I contacted DHL multiple times and they confirmed that although the Shipping Labels were generated, they never received the second passport from UKVI Department. I then contacted the UK-VI department on their paid phone number. The gentleman eventually asked me to wait for a few days. He couldn't confirm or deny if the second passport was shipped back to me or not. I then tried contacting UKVI once again on their paid line, and after arguing a couple of minutes with the lady because she was adamant that the passports have been handed over to DHL, she asked me to write an email to UKVI and then follow up there. This whole process has been very stressful for us and if we do not receive the passport before 20th of August then we might not be able to travel to the UK at all (wife pregnant and not fit for travel after August) and thus costing us about €450 for nothing. Did anyone have a similar experience before? Or knows who I can approach in this situation. Is there anything better I can do here? Edit: The passport also had a 10 year US Visa, so I will have to go through all of that process once again. And now I don't even have a reason to visit U.S so I don't know if they would even issue it. Many years ago, my UK and my wife's non-EU passport were lost by the Royal Mail as we were applying for her initial one year residency visa to be extended to indefinite. The Royal Mail recovered my passport and a damaged envelope but not hers. This was very worrying as there was little hope of getting her passport replaced before her UK visa expired. It is a complex process involving a report witnessed by a Public Notary and visits to the far away embassy. I am pleased to say that the Home Office were very good; I faxed (remember it's an old story) them a report and they faxed back an acknowledgement confirming that the visa renewal could wait for her passport to be replaced. This was also confirmed by real paper mail. Dealing with the Royal Mail was tougher but I persuaded them to pay the full cost of replacing the passport including the notary's fee though not the cost of travel to London. No lawyers were involved, just tough and persistent complaining by me. No shouting, swearing, or offensive language just determination. My colleagues overhearing some of my calls were very amused. Short answer is that you should pursue this with the shipper, rather than with the courier. Something as important as government documents are generally shipped with a requirement for a consignee signature (yours), and sometimes insurance. If the shipper has given you the tracking number for your package, you can point out that the package has no Proof of Delivery (signature), or any evidence at all that the package was actually sent to you (no tracking information). If the shipper sent the package out with insurance (the agreement with most major couriers is that if they lose or damage your parcel, they will reimburse you up to the specified insurance limit), then ask them to open a claim with DHL. This may not be worth much to you, but it will put pressure on the shipper to "do something" for you, and get involved in contacting DHL themselves. Let them do the arguing with DHL about whose responsibility the package was, and hopefully the shipper will give in, and accept that DHL never had the package. I'll quickly add as well, that when it comes to opening a claim (rather than just trying to track down a package), the company will only deal with the account holder (the shipper). So if the shipper tries to push back and ask you to do all the follow up on actually opening an insurance claim with DHL, you will likely be able to push it back to the shipper. And, since it is a government document, the shipper may even have a policy that they need to follow up on undelivered parcels. I can't speak for DHL in the UK or the Netherlands, but throughout many other countries, couriers provide electronic shipping software to shippers in order to enter shipments and produce shipping labels. This electronic shipment data is then sent to the courier's servers - often in a batch at the "end of day", as a final closure on all shipments departing. Based on the information that you've received from DHL, it sounds as though the shipper has submitted their electronic data for the shipment ("the paperwork"), but the package was never scanned. Thus, it's likely that the package was never provided to DHL. Again, I can't speak for DHL in the UK/NL, but as a package moves along its route to the destination, the shipping label's barcode will usually be scanned for tracking along its route. Every time it goes through a sortaton facility, or passed off to a new vehicle, it would be scanned, and added to the list of tracking events. If you were to go to DHL's website and track the package that you did receive, you'll probably see multiple tracking events throughout its trip to you. Human error can cause a package to accidentally have its scanning missed by a physical employee, but scans done at a sortation facility are often automated (package is placed on a conveyer belt), and any package going across the border would also be likely to have a high priority on not having any scans missed. So, since there are no scans, it's likely that the package either never left the shipper's location, despite the shipper creating a shipping label for it. It's possible that something else happened - such as the shipping label being damaged/unreadable, or the package being lost as soon as the DHL employee touched it (eg it fell out of a bin as the employee was taking it out to the truck, or something), but that is less likely. DHL cannot do anything for you if they have no record of receiving the package. And if you were to try and sue them, it's unlikely to go anywhere. Imagine the precidence it would set if any DHL customer could enter a shipment into DHL's system, then not hand over the package, and then sue DHL for "losing" the package. Not the answer you're looking for? Browse other questions tagged visas uk standard-visitor-visas los or ask your own question.